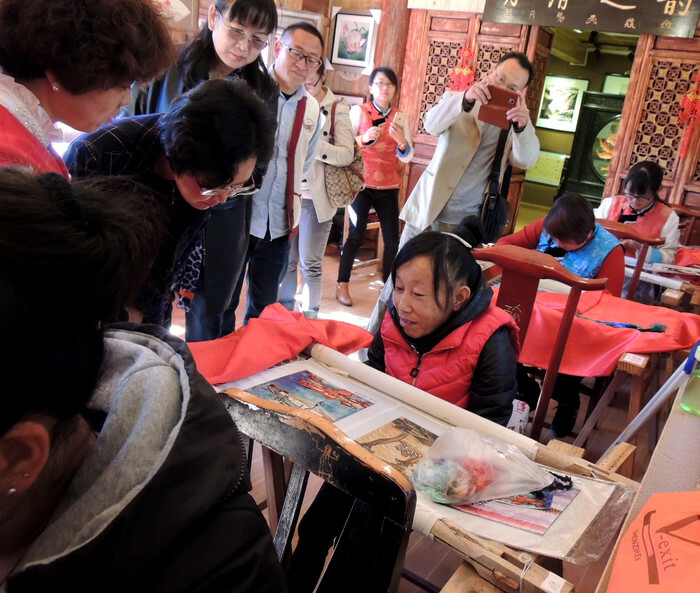 Baisha Naxi Embroidery Institute is located in the World Cultural Heritage site- The ancient town of Baisha, which is the ancient capital of Naxi(Baisha is at the foot of Jade Dragon Snow Mountain). It is the largest and best ethnic embroidery institute in China. 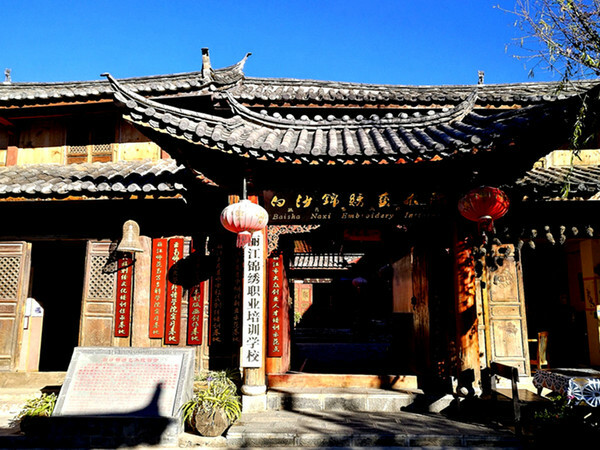 It occupies an area as 3200 square meters, and has four typical Naxi ancient courtyards. This Institute was opened in 2003 with the support of the government.Zhang Chunhe, the best and most famous Naxi painter, who is also the creator of the modern Dongba painting was invited to be the general art consultant.Xu Yunkui,one of the most famous strong colour wood-block prainter,a member of the National Art and Literature Association was invited to be the principle.And Mo Meiyan,one of the best skilled ethnic embroidery masters was invited to be the embroidery preceptor. There are 8 Naxi masters, 16 teachers and over one hundred students in the institute. The missions of this institute are: firstly, to preserve, maintain and develop the local Naxi handmade embroidery which had been disappearing since the Cultural Revolution;Secondly, to teach and train more and more local Naxi and other ethnic farmers to become embroiderers and try to make Naxi embroidery become one of the main industries for the local people;Thirdly, to protect, maintain and promote Naxi Dongba culture and art. Since the institue had been opened, it had cooperated with the Women's Federation, the Human Resources and Social Security Department, the Immigration Bureau,Federation of Disabled Persons,Cultural Affairs Bureau and other departments concerned to protect, maintain and promote the ethnic embroidery technique and culture. The institute had opened seven community classrooms in the countryside to train the ladies who have no good educational background but want to learn the ethnic embroidery techniques to earn their livings. Two of the community classrooms are opened in two immigrants villages. (the immigrants here refers to the people who were moved from the Yangtze river valley by the terrace hydropower dams. They were given a big new house, some money but not enough lands,so embroidery become one of the best choice for the women to learn to earn their livings.) 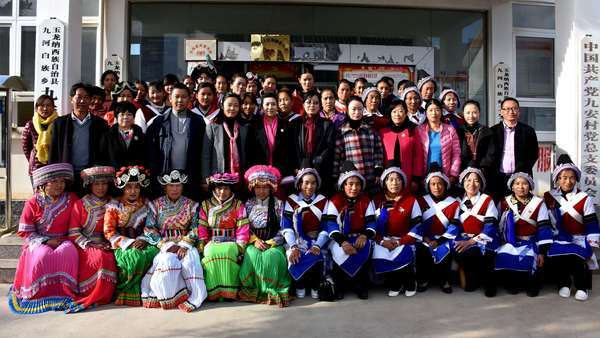 The institute had allready trained over 200 people(Naxi,Pumi,Lisu,Yi,Miao,Bai,Tibetan nationalities) from the ruralareas or remote villages. The institute also sign contract with the ladies who had graduated from it's training classes to employ them or to help them to sale their embroidery works. The institute also manage the works from masters, teachers and students to exhibit in Shanghai,Beijiang, Kunming and other cities. And many of the works won gold and silver prizes in different scales.Yang Jinfeng, a Naxi embroidery master won the reputation of "Yunnan Provincial Embroidery Master" from rencent years great work.Xiongyang, a Pumi embroidery master won "Yunnan Provincial Superior Ethnic Embroidery Master" from a competition in 2016. 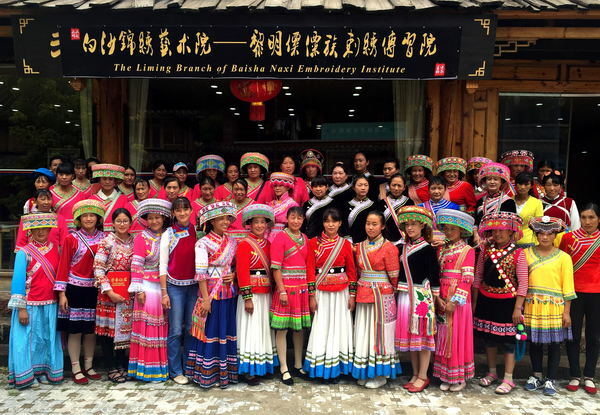 Bcause of the great contrabution of cultural maintaince, premotion and the women's employment.Baisha Naxi Embroidery Institute was honored as "Model of Women's employment","Pioneer of the Provincial Handcrafts and Women's Employment","Foundation of Human Resources Training" etc. The institute are gaving more and more attention by different government departments concern form both municipal and provincial level. It also facing more and more marketing presure withing more and more women are involved. Baisha Naxi Embroidery Institute really needs more surport from home and abroad on marketing and works collection.